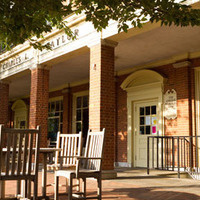 Located a few paces from Wait Chapel, the Bookstore is a popular destination for Wake Forest students and visitors. The Bookstore is located on Hearn Plaza on the first floor of Taylor House. This also makes it a convenient place to stop and shop. Enjoy the fireplace that affords the bookstore the comforts of home. As a special “perk,” self-service Starbucks coffee is available along with fine teas, refreshments, snacks and other sundry items. The Bookstore also carries the coveted Cosmetics line Boots Cosmetics. In addition to its selection of books by Wake Forest University authors and gifts, the Bookstore also carries greeting cards, snacks, candies, helium balloons, an Ink Cartridge refilling system, special order Greek Apparel, jewelry, and school/office supplies from Office Depot. While typical college bookstores carry logoed apparel and related merchandise, the Bookstore is more of a student living and gift store. Those logoed apparel items may be easily found at the Original Deacon Shop on Hearn Plaza and the Deacon Shop at Hanes Mall. Apple On Campus is also located in the Bookstore. The AOC store offers students, faculty and staff the opportunity to view and test a range of Apple products. Orders may be placed online to receive Apple Education pricing.